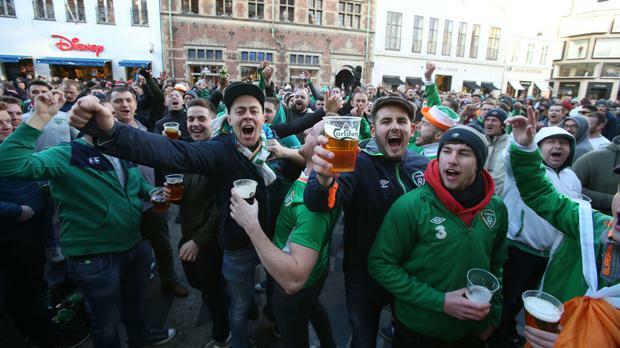 THE 2,400 fans singing in the away end of the Parken Stadium were certainly not the only Irish supporters who witnessed Saturday's battling draw in Copenhagen. Showing the trademark ingenuity for which they are famed, countless others took unofficial routes to secure seats in with the home fans. But with the Danish Football Union warning before the match that Ireland supporters attempting to enter Denmark sections of the ground risked being turned away, it was a night for covert operations. Never have so many red and white Danish fans had Irish accents. Alan O'Neill from Newbridge, Co Kildare and Barra de Roiste from Tallaght, Dublin went to particular lengths to effect their disguise. Dressed head to toe in red and white and with faces painted in the same colour scheme the pair felt they did a pretty good job blending in. "We dressed ourselves up, as you can see from the paraphernalia," said Mr de Roiste. "I had to take my child's red and white paint to paint our faces in the park - behind a park bench." Mr O'Neill added: "We disposed of our Ireland gear behind a well guarded tree." Their backstory, he explained, was they were two football supporters from Birmingham who belonged to a fanclub dedicated to former Aston Villa and Denmark centre half Martin Laursen. And their tickets were a prize won through said fanclub. "We are huge Martin Laursen fans," Mr O'Neill joked, pointing to a crumpled piece of paper purporting to be proof of the competition victory. As throngs of Danish fans filed down the stadium stairs after the final whistle and out into the night, more than the odd chorus of "Come On You Boys In Green" accompanied them.